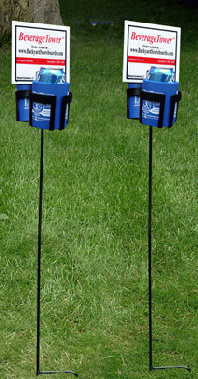 The BeverageTower is a free-standing portable drink holder for all of your outdoor activities. It easily pushes into the ground, and securely holds two of your favorite beverages. Holds Can, bottles, coozies, and even coffee mugs. The two-piece step stake comes apart for easy storage in the reusable Stash-N-Dash carry box. Made from all-weather materials designed to stand up to continuous outdoor use. Optional TailgaterStands for use on hard surfaces. Two BeverageTowers per box. Patented.